AlgiPharma is moving ahead with its clinical program and preparations for a new phase 2b clinical trial with its drug candidate OligoG. Australia will be a key part of this pivotal study. The AlgiPharma team recognizes the value in establishing a strong presence in Australia to help bring its lead drug candidate, OligoG, to the market for the treatment of patients suffering with Cystic Fibrosis. Cystic fibrosis (CF) is a life-threatening disease that affects the lungs and digestive system and impacts about 70,000 people worldwide. CF is caused by mutations in the cystic fibrosis transmembrane conductance regulator (CFTR) gene, which results in either no CFTR protein or an abnormal CFTR protein that does not function properly. The presence or absence of this dysfunctional protein causes the body to accumulate excessive levels of unusually thick mucus in the lungs, which becomes a site for infections that can require hospitalization. Respiratory distress in CF (defined as acute difficulty in breathing, infection and/or hospitalization) is most commonly related to mucus accumulation and lung infections that result in damage to lung tissue. AlgiPharma AS is a clinical stage pharmaceutical company with headquarters in Norway. It was founded in 2006 on decades of research and development carried out by FMC BioPolymer AS and the Institute of Biotechnology at the Norwegian University of Science and Technology (NTNU) in Trondheim, Norway. AlgiPharma has completed 5 clinical trials with two formulations of its lead drug candidate, OligoG, to treat respiratory symptoms of cystic fibrosis. AlgiPharma owns or licenses all relevant patents upon which the technology platform and products are developed. The company is supported by national and international research programs, and collaborates with a network of key opinion leaders, highly recognized academic institutions, research and patient organizations in Europe and USA. AlgiPharma has received more than USD 37 million in research and development grants from EU’s 7th framework program, Horizon 2020, and Eurostars programs, the Norwegian Research Council, Innovate UK, US Army through Congressional Earmark funding, and the Cystic Fibrosis Foundation (CFF). Please see latest award from CFF. AlgiPharma is a privately owned company registered and domiciled in Norway. A long standing collaboration between AlgiPharma and Professor David Thomas team at the School of Dentistry has been recognized this year by Cardiff University’s prestigious Medical Innovation Award. The award was presented by Dr. Rob Docherty on behalf of Cardiff University. 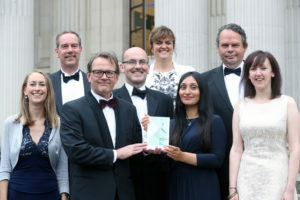 (Left to Right) Dr. Manon Pritchard (Cardiff), Dr. Phil Rye (AlgiPharma), Dr Rob Docherty (presenting the award), Prof. David Thomas (Cardiff), Dr. Katja Hill (Cardiff), Dr. Saira Khan (Cardiff), Mr Arne Dessen (AlgiPharma), Dr. Lydia Powell (Cardiff). Sandvika, Norway, June 3, 2016. AlgiPharma AS today announced an agreement with Cystic Fibrosis Foundation Therapeutics Inc. (CFFT), Bethesda, Md., to help fund the development of its inhalable dry powder, OligoG, which has been shown to improve the properties of mucus from the CF lungs and the effectiveness of some antibiotics in early research studies. Research to date suggests that OligoG will help people with cystic fibrosis clear mucus from their lungs and potentially slow the progression of the disease. To expedite development of OligoG for people with cystic fibrosis, CFFT committed more than $4 million to AlgiPharma. This is in addition to almost $6.9 million that CFFT has awarded so far for a Phase 2 clinical trial, bringing CFFT’s commitment to nearly $11 million. CFFT is the nonprofit drug discovery and development arm of the Cystic Fibrosis Foundation. AlgiPharma is currently in Phase 2 clinical trials with OligoG as a dry powder for inhalation. Two clinical trials are ongoing in Europe (recruiting in UK, Germany, Sweden, Denmark and Norway) evaluating the safety and tolerability of OligoG, and include primary endpoints to assess efficacy in individuals with CF. OligoG works to return thick, sticky mucus toward normal, allowing it to be cleared more easily from the lungs. OligoG also may disrupt the infectious biofilm often present in the lungs of individuals with CF. Biofilm disruption might also improve antibiotic effectiveness by increasing exposure of bacteria to antibiotics. Cystic fibrosis (CF) is a life-threatening disease that affects the lungs and digestive system and impacts about 70,000 people worldwide. CF is caused by mutations in the cystic fibrosis transmembrane conductance regulator (CFTR) gene which results in either no CFTR protein or an abnormal CFTR protein that does not function properly. The presence or absence of this dysfunctional protein causes the body to accumulate excessive levels of unusually thick mucus in the lungs. This excessive sticky mucus in the lungs becomes a site for infections that can require hospitalization. Respiratory distress in CF — defined as acute difficulty in breathing, infection and/or hospitalization — is most commonly related to mucus accumulation and lung infections that result in damage to lung tissue. For more information on CF, please visit www.cff.org. AlgiPharma AS is a clinical stage pharmaceutical company, based on research and development carried out by FMC BioPolymer AS and the Biopolymer Foundation at the Norwegian University of Science and Technology in Trondheim, Norway, over decades. AlgiPharma was founded in August 2006. AlgiPharma’s aim is to address unmet medical needs, fighting diseases effectively through its innovative alginate oligomer technologies, by developing products and therapies to market or license to suitable partners. AlgiPharma AS owns or licenses all relevant patents upon which the technology platform and products are developed. AlgiPharma AS is supported by national and international research programs, and collaborates with a network of key opinion leaders, highly recognized academic institutions, research and patient organizations in Europe and USA. The CFFT press release can be found here: CFFT press release June 3, 2016. AlgiPharma now features on the Cystic Fibrosis Foundation (CFF) drug development pipeline. The CFF interactive drug development pipeline shows the progress of potential CF treatments through the different phases of clinical research. AlgiPharma’s listing in the pipeline of CF drug development reflects the progress and potential for its mucus altering and biofilm disruption alginate oligomer therapy. Click here to find more information about the CFF interactive drug development pipeline. AlgiPharma was granted Orphan Drug designation by the FDA for its sodium alginate oligosaccharide, OligoG in the treatment of cystic fibrosis (CF). AlgiPharma has been awarded a new four year grant from the Norwegian Research Council for the project “Treatment of Chronic Infective Disease with Alginate Oligomer Based Formulations”. This study will focus on extended long term safety studies and formulation changes to further develop the AlgiPharma drug candidate OligoG for the treatment of cystic fibrosis. AlgiPharma has received a research grant from CFF, the Cystic Fibrosis Foundation, to perform an in-vitro study of its proposed cystic fibrosis medicine. The grant is administered by the Cystic Fibrosis Foundation Therapeutics Inc., a subsidiary of the CFF. The research shall be performed in the United Kingdom. About the Cystic Fibrosis Foundation: The Cystic Fibrosis Foundation is the leading organization devoted to curing and controlling cystic fibrosis. Headquartered in Bethesda, MD, USA, the Foundation funds CF research, has 80 chapter and branch offices throughout the United States, and supports and accredits a nationwide network of 115 CF care centers, which provide vital treatments and other CF resources to patients and families. For more information, visit www.cff.org. To advance the search for a cure, CFF has invested nearly $230 million in promising scientific research in the pharmaceutical and biotechnology industries since 1998. As a result, the Foundation has nearly 30 potential therapies in its drug discovery and development pipeline. Any one of these could have a profound impact on the lives of people with cystic fibrosis. AlgiPharma has been granted permission to start its clinical phase 2 trial in cystic fibrosis patients by the Irish Medicines Board. The study title is: A double-blind, randomized, placebo-controlled, cross-over study to evaluate the safety, tolerability and preliminary efficacy of alginate oligosaccharide (OligoG) administered for 28 days in subjects with Cystic Fibrosis chronically colonised with Pseudomonas aeruginosa. OligoG CF-5/20 was well tolerated when administered by inhalation to 28 healthy subjects. All adverse events monitored were mild and transient. No serious adverse events, no deaths, no discontinuations.